I must have been in third or fourth grade when I got this one; old enough to have already read the Chronicles of Narnia books, but still so young I was more than a little frightened by the nasty creatures Jadis has in her audience at the sacrificial stone table. It’s the first graphic novel I ever read, and is the only one I’ve re-read multiple times. They aren’t usually my preferred style, but this one captures the pace and spirit of those Narnia books nearly perfectly. My copy’s pages are torn on the edges and soft like old dollar bills from all the times I turned them, curled up by the fireplace or hidden under the covers at night. Most of the words come straight from C. S. Lewis’s original novel, just adapted and distilled by Robin Lawrie, who also drew the cinematic illustrations. She made sure to include a great deal of the dialogue between the siblings, animals, and Aslan without letting the conversations get too cluttered with text. It got to the point where I had memorized chunks of the real book, just because I could picture what was said and done in this illustrated version as though I had lived it myself. Lewis’s wonderful descriptions aren’t lost here, either. 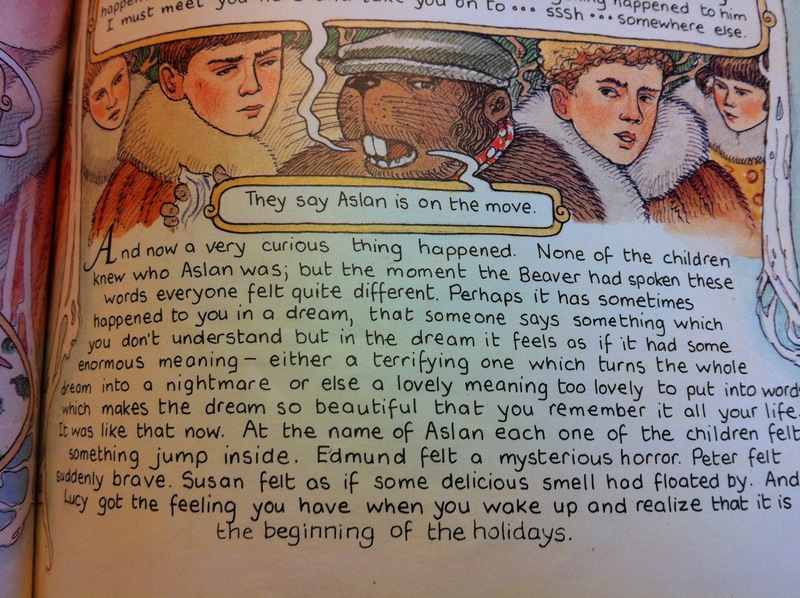 Paragraphs from the book that capture his magical balance of winter mystery and hopeful warmth are not left out, including one of my favorites about the first time the Pevensies hear Aslan’s name. That’s the feeling that used to define Christmas Eve for me: anticipation and history. The strange combination of coziness and goosebumps. I remember reading this book the night it was given to me and feeling like I’d gone straight through the wardrobe with Peter, Susan, Edmund, and Lucy. How horrible it would be to live in a world where it was “always winter, never Christmas.” And how grand an adventure to go about bringing Christmas back. 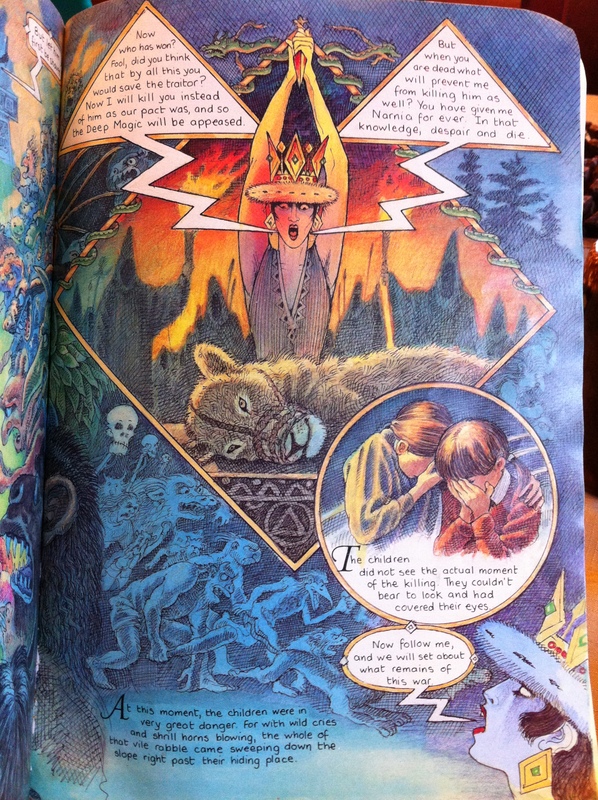 I loved the illuminated style of the illustrations: the creative borders with animals, trees, and heraldic symbols characterizing each chapter’s mood. The pictures are expressive, particularly the characters’ faces and all the movement in exciting scenes of battle or escape. C.S. Lewis has described Narnia so well in his books that fans of the series can picture certain settings in their mind’s eye like photographs of real places. The illustrations here can go along hand-in-hand with your own inner Narnia: no artistic liberties veered too far away from my own imaginary constructs, at any rate. The Beavers’ house, Cair Paravel, even the Professor’s mansion are brought to life in a simple but solid manner. 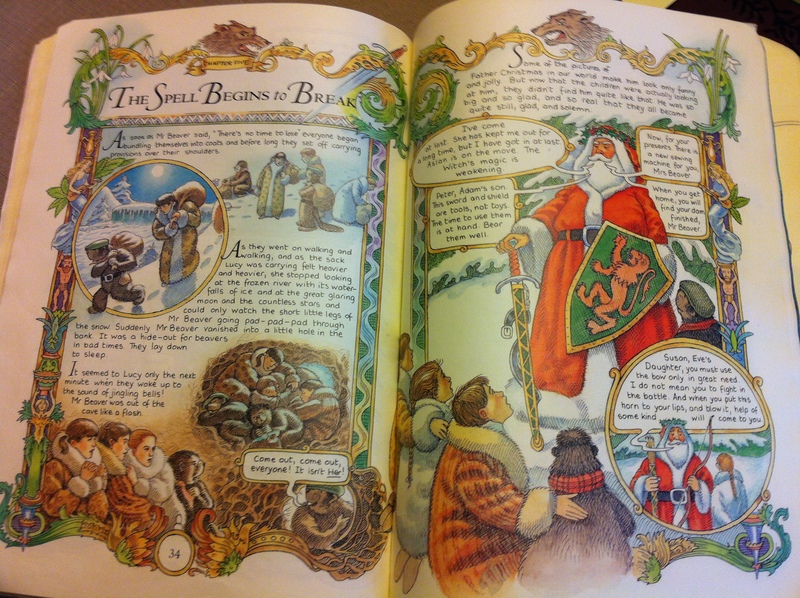 The embellishments of style and extra details get to stand out in the framework and the layout: columns with carved satyrs on either side of the pages in which Mr. Tumnus describes Narnia in the spring, or the twisted roots around the picture where Lucy finally brings her siblings through the wardrobe and into the woods. 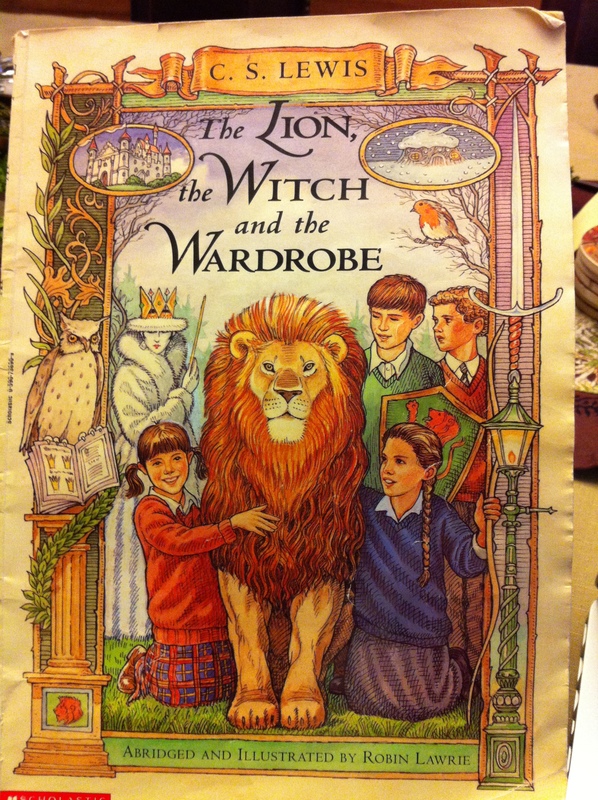 The Lion, The Witch, and the Wardrobe is such a good story. It has a tint of medieval romance – Lewis was a medievalist as well as a fiction writer and theologian – as well as an enveloping glow of childish goodness that can fight back even the most biting winter miseries. Robin Lawrie’s adaption is colorful, exciting, serious, and blessedly faithful to the original book. I loved it as a little kid, back when Christmas Eve was a night of heart-in-your-throat nervous excitement. I love it now that winter has taken on a more medieval coldness in my older-ish age, because it warms me up: the memory of reading it three, four, five times in one month acting like embers that have not quite died out. In all his years as an apprentice historian, Tom Natsworthy has never doubted the moral supremacy of Municipal Darwinism; that is, mobilized cities and towns hunting each other down and consuming weaker suburbs for resources all over the ravaged carcass of Earth. London, his beloved city, is on the move and he’s sure it’s the best city-on-wheels in the whole world. After all, his hero Thaddeus Valentine – the dashing airship explorer and collector of Old-Tech like mysterious compact discs and other artifacts from before the Sixty Minute war – is a Londoner, and Tom wants to be just like Valentine someday, despite his own lowly status as an orphan apprentice at the museum. When he rescues his hero from a revenge-bent young assassin girl, though, Tom finds himself stranded on solid ground while London thunders on in search of better hunting grounds, and he must come to terms with the numerous secrets which suggest that London is not as ideal as its townsfolk (and passengers) assume. The adventures which await our young hero star a cast of unforgettable characters including a deformed girl with a painful past, some museum curators with more gumption than meets the eye, a charming but mysterious rebel pilot, treacherous villains with impeccable manners, and a roving town operated by greedy pirates. The more Tom learns about the world London travels over, the more he begins to realize that someone needs to take action before history repeats itself. And, as Valentine’s daughter Katherine is simultaneously realizing from aboard London – where some seriously scientific tension has been building – the world might need to be saved sooner rather than later. It took a little while for me to decide that I loved Mortal Engines. It started out as a decently interesting Young Adult adventure, with good elements of futuristic world-building as well as steampunk-ish atmosphere and an interesting premise, but the cool idea of cities eating each other wasn’t enough to draw me in. Luckily for me, a friend had mentioned that the story picked up after the first few chapters, and I’m incredibly glad that I kept reading. Once Reeve introduces some devastating betrayal to the plot, and Tom Natsworthy gets a chance to prove himself as a morally complex character, the intrigue of Mortal Engines picks up steam and demands your attention until the very end. 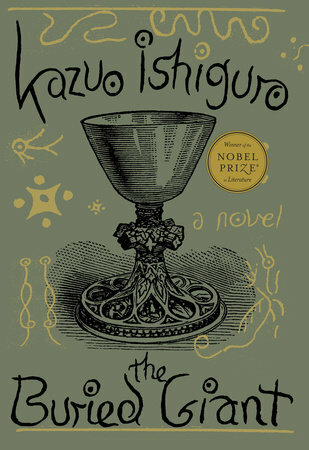 The last hundred pages or so were so exciting, so unexpected, and so well written that I stopped trying to savor the book and just read as furiously as possible. The ending especially…well, let me just say that Mr. Reeve breaks the conventions of children’s fiction with great skill. 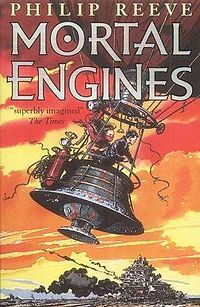 I know that there are books which follow Mortal Engines, but even on its own it was an unexpected and inventive book; one which I have already recommended to several young readers on the hunt for some thrilling adventures. The characters Tom meets on his adventures were truly unique, and while I might be slightly biased since so many of them are pirate-types, I can promise that they are written very well even beneath their swashbuckling surfaces. Philip Reeve does an excellent job of showing how difficult it can be to reconcile one’s actions with what one believes is right. The book’s young heroes must sometimes let other people get hurt in order to preserve themselves and their missions. The villains aren’t necessarily soulless monsters (although those exist in the story, too). Bad guys love their families, good guys can be selfish, and most of the people living in this messed-up world just want to get through their lives without having to experience their town getting eaten by a bigger one. I tend to prefer YA adventure and speculative fiction to have more young characters than adult protagonists, but in Mortal Engines the grown-ups and children alike are vividly drawn and memorable. With extremely high stakes driving the action, it was nice to read a book in which individuals were defined by their skills, courage, and choices rather than their ages or, indeed, their races and political beliefs. Heavy ideas like the politics of imperialism and scientific exploitation contribute to the story’s drama, but the mix of historical atmosphere and inventive future setting of Mortal Engines remains a consistently well-balanced stage for Tom’s story. I would recommend Mortal Engines to young readers who want more adventure than romance in their books, and who don’t expect everything to turn out just fine as they read about harrowing journeys. 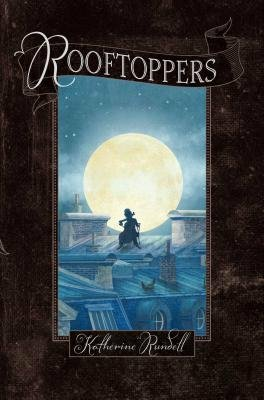 The book is appropriate for anyone aged eleven up, and would appeal to fans of steampunk; pirate stories; and both historical and science fiction. Think the age group at which series like Artemis Fowl and The Chronicles of Chrestomanci are aimed. The writing style is traditional and old fashioned without being annoyingly so, and there is a fairly equal balance of genders and races to keep more than just pretty-but-awkward teenage white girls feeling represented. 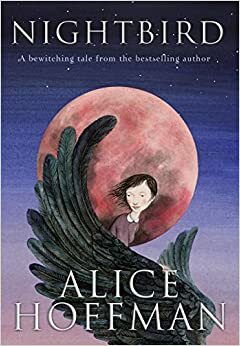 Even adults should read this book, especially anyone who has enjoyed Stephen Hunt’s The Court Of The Air or Terry Pratchett’s Discworld books. It’s a great story, one which has been captivating readers for over a decade, and I hope people will be talking about it for many years to come.